On 23rd September there will be a candle-lit labyrinth on the recreation ground, starting at 7pm: a lovely way to mark the turning of the seasons. Looking forward to October we have Round 2 of our Bird Drawing Challenge in which I hope we’ll complete drawings of the final 65 birds. This event is promoted as part The Big Draw, so hopefully we’ll manage it! It takes place 10am-2pm Monday 27th October in the North Room of St Andrews Church, and all ages are welcome, as before. Many thanks to Mandy Maxwell for her support. We will be exhibiting photos, drawings and films from this project at a public exhibition on Saturday 1st November. Please keep an eye on the website for details. The second half of July was very busy: the wallhanging group met on 23rd July and most people had either a completed square or a significant work-in-progress. There are some lovely photographs on our website here, and the next meeting is on Monday 8th September. The next day I met up with seven members of the Girton Youth Project. We spent the morning drawing and cutting stencils in Cotton Hall, on a theme of woodland animals. The aim was to construct a new temporary space for painting in the heart of the Girton Wood. We had previously discussed methods of non-destructive graffiti, and one suggestion stuck: that of painting directly onto clingfilm stretched between trees. We set out to find a spot where the trees were open enough to give us the space we needed: thankfully, the somewhat regimented planting pattern of the woodland worked to our advantage. Over the next few hours we painted each side of the clingfilm, where everyone was given space to do their own work in relation to the construction as a whole. There are some incredible artists in the group. Then, at the end, the entire work was cleared away in a matter of minutes! Visit the website for photographs. I also met the 14-16 year old summer school students at Cambridge Academy of English, talking about the Passing Through and Settling project, and specifically asking the students to teach each other common bird names in their own languages. I hope to use these words in conjunction with the bird drawings from the 12th July to make a ‘Girton Bird Guide’ later in the year: ‘bird’ is ‘ptitsa’ in Russian, ‘pajaro’ in Spanish, ‘lintu’ in Finnish, and ‘tori’ in Japanese. Looking forward to September we have the Candle Lit Labyrinth on the 23rd, at 7pm on the recreation ground. Thank you to everyone who took part in the Bird Drawing Challenge on 12th July! The project aim was to draw a picture of every bird species that had been spotted in Girton, from a list contributed by BirdLife International. There were about 130 species, and we managed 62 drawings. A few extra birds have been allocated to some people who couldn’t make it on the day. Our youngest contributor was aged 1: proof that all you need is a willingness to give it a go. There are still just over 50 birds to draw, and the event was so enjoyable that I think I will repeat it in some form in the Autumn, perhaps as part of the Big Draw. The drawings are soon to go up onto our website, and will be exhibited in October. I am leading a session with Cambridge Academy of English students on 23rd July, where we will teach each other the names of birds in our respective languages. That evening, the wallhanging group will meet at 7.30pm at Orchard Close. A number of squares have already been finished, with some beautiful embroidery. The next day I will be working on a project with some of the Girton Youth Group, taking a long walk through the village footpaths. Just a reminder: if you have planted a sunflower in your garden and wish to be included in the sunflower trail please email me a photograph of the sunflower, with your address, so I can plot it onto a map. Photos submitted by 31st August will be entered into a prize draw for gardening goodies, and there will be a prize for the tallest sunflower. Email me to enter. We have also just had the second meeting about the wall hanging project led by the WI. A number of participants have already started their sections, and we hope to show a few photographs of work in progress at the stall on 12th July. 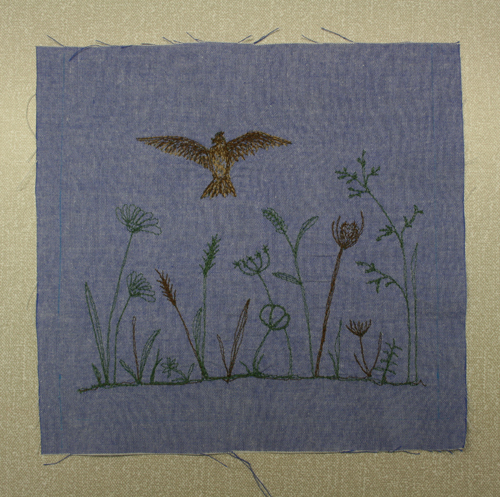 Katherine de Winter has finished her skylark (below), and is now on to a greenfinch! I am in discussion with Girton Glebe, and the Youth Group to develop projects with them, and have just confirmed a temporary labyrinth in the Recreation Ground for the Autumn Equinox, thanks to Girton Parish Council. 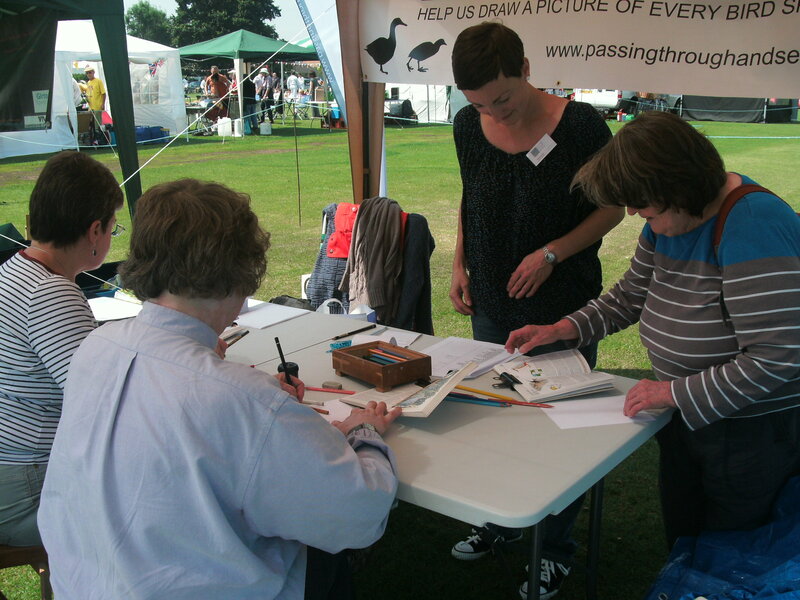 The next public event is the Bird Drawing Challenge at the Family Fun Day on 12th July. I have a list of about 130 birds that have ever been spotted in Girton and I am asking visitors to choose one each to draw. The collection of drawings will be exhibited in October. I will provide the materials and pictures to refer to, so please just pop in and have a go.